12 Mammoth Hot Springs -- How Many Wolves? 21 Calcite Springs -- A Black Bear or a Grizzly? 26 Alum Creek -- Was That a Wolf or a Coyote? 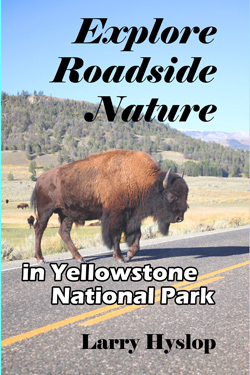 Increase your enjoyment of Yellowstone National Park. Discover fascinating details and facts about this world-famous natural world. Yellowstone contains 370 miles of paved road, so exploring the park requires hours of driving. At Lamar Valley, why do ravens view humans the same as large predators such as grizzlies and wolves? At Old Faithful, how can rangers make such accurate predictions of Old Faithful eruptions? At Hayden Valley, how have reintroduced wolves changed the park? At Fishing Bridge, why are lake trout wiping out native cutthroat trout? You will enjoy these articles in preparation for a park visit. You will discover interesting details while traveling Yellowstone roads. You will find answers to questions that come up following a drive. Articles are searchable by road location and subject matter. Photos of each subject and the location enhance the descriptions.